That understanding, together with the constitutional structure, imposes something like a duty of consultation between the president and members of Congress. Otherwise -- and you may have heard about this -- the government will have to shut down. Barack Obama hasn't engaged in much consultation this summer and fall. He has announced he won't negotiate with House Speaker John Boehner. 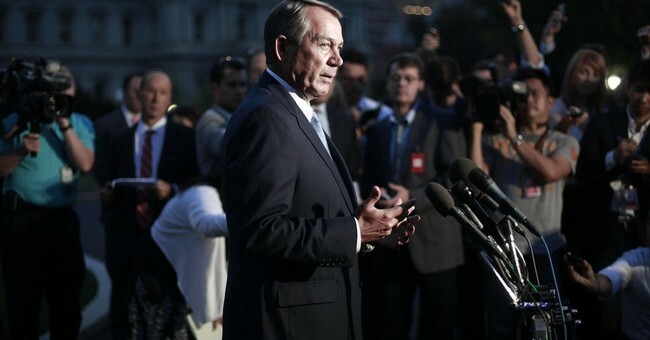 His defenders note that Boehner has stated publicly he won't negotiate with the president. Boehner believes Obama unfairly upped the ante in their "grand bargain" negotiations in August 2011. As a practical matter, it's Obama's refusal to negotiate that matters. A member of Congress can't get time with the president or his top aides on demand. A president can always get through to a member of Congress -- as Obama did, finally, Monday night for a conversation described as "less than ten minutes." The Post's Wonkblog helpfully listed 17 government shutdowns since the late 1970s. Almost all involved legislative-executive disagreement over ancillary issues. The bulk of pundit opinion, on the Right as well as the Left, holds that House Republicans blundered by attaching Sen. Ted Cruz's defund Obamacare amendment to the continuing resolution funding the government. Democrats would never accept that, they say. And voters will blame Republicans for shutting down government. Many pundits also say House Republicans' amendment delaying Obamacare was foolish for the same reason, although "delay" polls much better than "defund." Cruz argues that once people receive Obamacare subsidies, they will be hooked and support the program. It's an argument akin to Mitt Romney's 47 percent. But beneficiaries of government don't necessarily vote Democratic. The state with the highest percentage of residents who receive disability insurance, West Virginia, voted 62 percent for Romney. Moreover, it's not clear that Obamacare subsidies will be that generous or visible. On Tuesday, the day the health exchanges were supposed to open, many Obamacare websites were giving error messages. Divided government is not exactly a novel thing. We've had a White House controlled by one party and at least one house of Congress held by the other for 32 of the last 45 years -- 70 percent of the time. It's the default mode, not an exception. The current divisions result from what I call volitional migration in my just-published book, "Shaping Our Nation: How Surges of Migration Have Transformed America and Its Politics." Americans have been moving to places they consider culturally congenial. Democratic voters -- blacks, Hispanics, gentry liberals -- are heavily clustered in certain central cities. They give Democrats an advantage in the Electoral College. So both sides have a legitimate mandate -- but not an unlimited one. Republicans are furious that their members can't defund or delay Obamacare. They want to see politicians stand up yelling, "No!" Theater has a function in politics. But in fact, they've had a partial victory this year, a win that didn't seem likely last December. By accepting the sequester despite its defense cuts, Republicans have actually dialed down domestic discretionary spending. Democrats' position now is essentially the sequester. They're swallowing something they hate. No wonder Obama seems sullen. So both sides will have frustratingly partial victories and not get everything they want. That's how James Madison's system is supposed to work in a closely divided country.